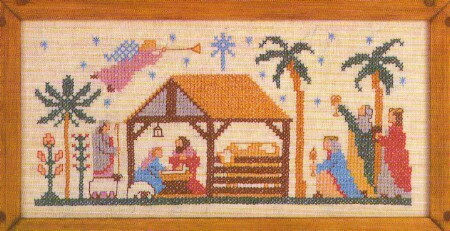 This cross stitch stamped sampler Christmas craft kit highlights the biggest and most Blessed Event that changed the World.A cross stitch printed sampler that is a must for anyone during the Christmas season and something that can be passed down from generation.Start a Christmas Needlework project for young girls during Sunday School.You can teach many lessons this way. I am writing this review for my mom. She had made the Christmas Creche for me a few years ago and I get so many compliments on it she is making more for others in the family. She loves the quality of the thread and canvas and that the pattern is easy to see. She says it is very easy to work on. I just got my Creche sampler and I am really excited about it. I have just started it and it is moving along nicely. I am happy with the quality of the sampler. I am making it to frame and put it on my bookcase for display at Christmas. Looking forward to buying something else when I am done. Love it. Just finished. It came out beautiful. Will give it to a dear friend for Christmas. As always, CS has enjoyable kits. More than enough floss, perfect needle. Stamping and chart are without flaw.